Large capacity and sturdy rigid covers make this excellent for storing a manual or lengthy report. Embossed panel for perfect placement of title. Sturdy rigid paperboard stock with smooth, distinctive finish. Tape-reinforced hinge holds up to frequent referencing. Embossed title panel on front cover. Acid-free. 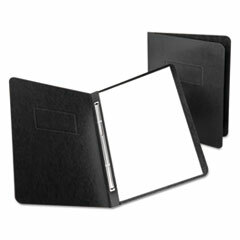 Back Cover Color(s): Black Capacity Range [Max]: 3"
Weight: 0.00 Manufacturer: ESSELTE PENDAFLEX CORP.